The Japanese Super Dining Restaurant "SHUNMI" offers a great deal on its summer course menu from July 1 through end of September. 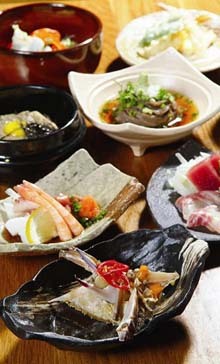 Pursuing the premium taste, SHUNMI has been better known for its quality of cuisines for gourmets. How about the same dishes at a surprise deal? You can knock its door now and make sure the prices are real. "Cold Buckwheat Noodle Set" featuring buckwheat noodles and assorted rolls and dessert is offered only at 24,000won. "Clear or Spicy Sea bream Hot Pot Set" is another surprising deal at 28,000won. The Japanese restaurant also serves its long-time favorite, a table buffet, priced at 30,000won, featuring assorted sashimi, assorted sushi, fish tempura, Japanese Style natto with Sashimi, Beef & Vegetables Teppanyaki and a lot more. If you look for an upgraded course menu, go with a 45,000won dishes such as Braised sea bream set with seasonal salad, assorted sashimi, Braised Sea Bream and dessert. The 55,000won "Beef Teppanyaki Set" fully features Smoked Sea bass with Salad, Assorted Sashimi, Broiled Salmon, Beef Teppanyaki, Bean Paste Soup, Cold Thin Noodle and dessert. Guests who spend more than 100,000won at the restaurant are eligible for a lucky draw to win a free 14-day Santa Cruise trip to the Mediterranean. For more information, visit our website at www.ambatel.com.